Take Flight! Wildlife Education provides traveling educational programs for schools, nature centers, club meetings, zoological institutions, historical fairs, and any other organizations interested in learning about wildlife and ecology. Through the use of live animals, natural artifacts, and theatrical techniques, Take Flight! brings the importance of understanding the natural world to life. Raptors: hawks, owls, falcons, and their kin have long held our imagination. See what it’s like to be hawk eyed or falcon fast by meeting these magnificent predators up close and hearing the stories of our shared history. 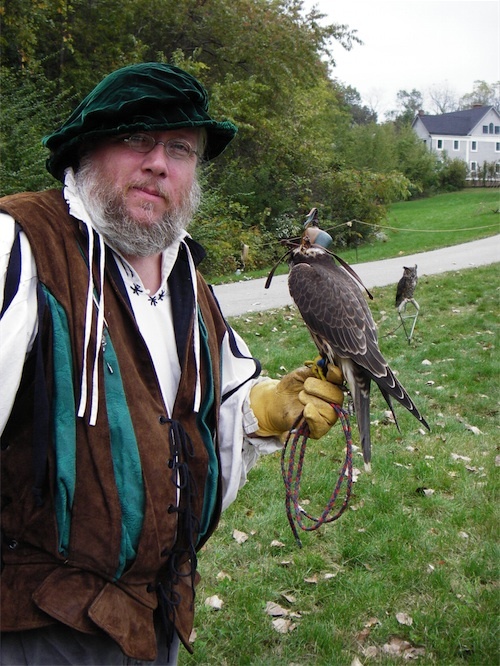 Learn about the ancient and intricate art of falconry from either the Medieval or Renaissance period as the Royal Falconer discusses the natural history of birds of prey, the historical significance of falconry and how raptor awareness helps us track environmental health. Falconry was the “Sport of Kings,” find out why birds of prey are still vital to us today. Meet Mr. Varmint, he’s been livin’ out in the woods for so long that it’s hard to tell him from some of his critter friends. This old man of the forest is happy to share stories about how animals adapt to their environment. Mr. Varmint always has a few animal artifacts with him to show folks what he’s talkin’ about. He can be a bit scary at first, but he’s pretty fun once you get to know him. The animals that share our planet inhabit important ecological niches and perform valuable roles in nature. Discover interesting facts, personalities, and stories about some of the creatures around us. The birds around us have many stories to tell. Discover what makes a bird a bird and why keeping our eyes to the sky helps us keep track of the health of our planet. Slimy and scary? Don’t believe it! These much maligned reptiles deserve to be understood, experience the truth. Compare and contrast mammals, birds, and reptiles or learn about predation and the food chain with programs designed to explain animal interactions. Books like My Side of the Mountain and Silent Spring are often the catalysts that start young people to a lifetime of environmental awareness. Let Take Flight! bring these books to life with programs based on these and other literary works. The world’s rain forests are being destroyed at an alarming rate. Meet some rain forest denizens, and learn more about why they are important to you, in an introduction to this amazingly complex ecosystem. Want more information? Email us at info@takeflight.org or call 317-289-9875. Birds of prey and other native animals are protected by federal law. Take Flight! possesses all necessary state and federal permits to conduct these educational programs.